WATCH: The John Lewis Christmas advert has arrived! The much-talked-about John Lewis Christmas advert is finally out. Earlier this week, we confirmed that the theme music for the advert would be a cover of Randy Newman’s “One Day I’ll Fly Away”, performed by the Vaults. A mysterious Twitter account with the handle @Bouncing2016 then released two ten-second teasers for the new advert, featuring an adorable Boxer dog and his equally adorable young owner. The teasers clued most people in to the characters who would form the emotional heart of this year’s advert. Today, the advert has finally dropped in all its two-minute glory. Without further ado, check out Buster the Boxer and Bridget’s bouncy story. 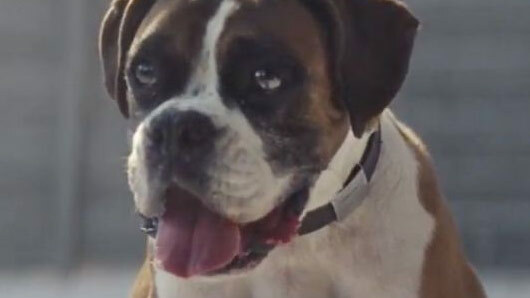 The advert follows Buster the Boxer, a dog who enviously watches his owner Bridget bouncing on her bed. For Christmas, Bridget’s parents buy her a new trampoline, but the night before nearby animals get their chance to bounce without Buster. Finally on Christmas morning, the trampoline is unveiled – but before Bridget can get a go on it, Buster takes the opportunity to finally bounce for himself. The advert seems to be a departure from recent attempts at hitting the festive emotional jackpot, being far simpler and less of a tearjerker than last year’s “Man on the Moon”. However, we’re sure Buster the Boxer will still manage to capture hearts nationwide. Seriously. Look at that adorable longing face.